Another free tasting "Wine House" , this one for Pierrefeu wines . Pierrefeu is a nice provencal village north east of Toulon , about 20 km from the mediterranean sea . 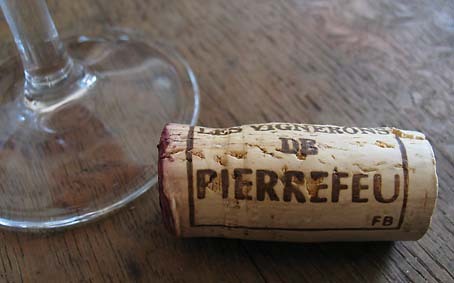 Pierrefeu (map) is one of the 5 Cotes de Provence wine sub-appellations ( the others are : Frejus , La Londe les Maures , Montagne Sainte Victoire , and Sainte Baume ) wich should in the coming years get their separate label . 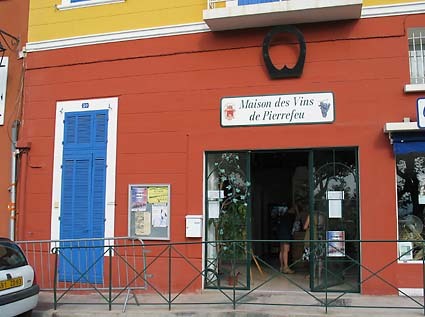 So , Pierrefeu-Cotes de Provence wine producers have a front window with this Maison des Vins , conveniently situated on Pierrefeu main street , facing the central parking lot from wich you can enjoy the panoramic view over the Maures mountain range . Here you can taste Pierrefeu wines for free, and buy the bottles (if you want to) at the producer's price . This is a bargain . Phone is : 04 94 28 11 89 . Mireille Mann, who operates the Maison is a warmful young woman from Alsace who settled with her husband in the region . Both are from alsatian families deeply rooted in the wine world . When I first came here last year , I asked if she was From Alsace by chance . I had recognized the intonation peculiar to this part of France . She was surprised that I noticed it . I lived in Alsace several years and it is still my home "quelque part" as we say in France . Mireille Mann (left) Mireille Mann has answers for the many questions we have and knows about the different wine cultures of the Domaines, and also about the grape varieties , the geological influences on the wines . She tells us about the climate last year and in 2002, and of its impact on the wines . 2002 was rainy in the Pierrefeu area . Some of the grapes were rotten . Good wines were nonetheless produced this year . And last year , in 2003 , big forest fires on the other side of the Maures mountain range pushed many wild boars on this side of the mountains , and in the Pierrefeu vineyards . Even without forest fires , wild boars do a lot of damages in Provence vineyards . They usually descend nightly from the mountains and eat as much as they can . Vegetation in the mountain is very dry and the vineyards are easy food in contrast . It is common to see electrical fences along vineyards close to the first slopes of the mountains . So in 2003 , such damages were increased indirectly by the fires . There are 3 ways to vinify here : __ Direct pressing . Minimum colour given to the wine . Clear colours . This is a white wine vinification except it is also applied to red wine grapes . __ Bleeding . Grapes in the vats . Then maceration time between 4 hours and a day . Then , open and let the first juice out . The rest goes for the reds . __ Skin maceration ( thermoregulated ) Here the harvest begins early september . Reds are often done last . 2003 was a superb year for perfectly matured and healthy grapes here . Now tasting time . Our host looks for a wine to begin with and respect an tasting order . Here there are no rotating tasting list , so you can basically taste any wine the Maison has in its selection . 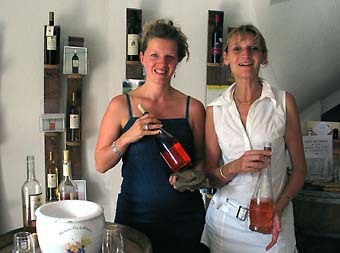 We first taste wines from vineyards in plains :__1__Domaine de Carrat rose 2003 . Direct pressing . 80% Grenache 20% Cinsault . 6 Euro . Limestone & sandstone influence . With seafood and as aperitif . Nice . Mireille Mann explains us the two different soils in Pierrefeu : Inland side is the permian depression . Seaside : Tight and vertical schists . these differences translate into the wines . __2__ Domaine de Peirecedes rose 2003 . "Cuvee Ariane" Mourvedre majority . "Saignee" or bleeding wine .5 Euro . __3__ Domaine de Peigros rose "Cuvee Elegance 2003" Bleeding cuvee . 6 Euro. Long in the mouth .Cherries . __4__ Chateau de l'Aumerade rose Cru Classe 2003 . "Seigneur de Piegros" . 8,1 Euro . Skin maceration , low temp . Aromatic nose . Impressing . Results from the low temp maceration . Clear colour (pale salmon) . Specially designed bottle [see picture on left]. This Domaine has altogether 550 hectares, of wich 89 in Cru Classe . It was already well known in the french kings era, especially when King Henri IV discovered it in the 16th century . Now we taste wines from vineyards on the slopes : __5__ Domaine de peirecedes rose 2003 "Regue des Botes" Shcists and slopes . 6,2 Euro . Very mineral . Different from the others . __6__ Domaine la Tour des Vidaux rose 2003 "Farnoux" . Schists . Vineyards on a sort of amphitheater . 6,25 Euro . We now taste the reds : __8__ Domaine de Peigros red 2001 "Prestige" . Almost only Grenache . 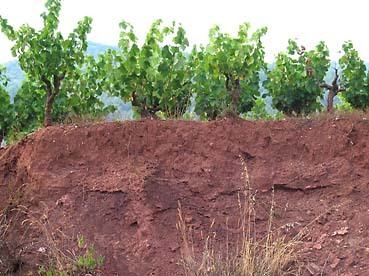 Peigros vineyards are in the plain between Pierrefeu and the mountain range . 5 Euro . __9__ Domaine de Peigros red 2001 "Debut de Siecle". Mostly Syrah . Woody, but I like it . 8 Euro . I discovered Domaine de Peigros wines in this very Tasting House a year ago with the basic red 1999 . I bought a case then and did not regret it . I am going to visit the place . __10__ Vignobles Kennel red 2001 . Nice . Really good .Vineyards in the plain . 6 Euro . Syrah-Grenache .Aged in casks (not new ones) . __11__ Chateau la Gordonne red 2001 "Les Marronniers" . Oak casks . Cabernet Sauvignon . Vineyards in the plain . 5 Euro . __12__ Domaine de Carrat red 2001 . Cabernet Sauvignon-Syrah-Grenache . On slopes . 6 Euro . __13__ Domaine La Tour des Vidaux red 2000 "Tourelle" . Carignan-Grenache . Oak casks . 5,8 Euro . You recognize the Carignan style . Organic viticulture . Biodynamy . Good value wine . __14__Chateau la Tour de L'Eveque red 2001 . Also on slopes . Syrah majority . Black fruits . Liquorice . 9,2 Euro . __15__ Domaine La Tour des Vidaux red 2001 "Cuvee Farnoux" Syrah-Cabernet Sauvignon . Also in biodynamy . Slopes . 9,7 Euro . Very correct wine . My choice . __16_ Domaine de la Broquiere red 2001 "Cuvee terres rouges" (means "red soil"). Back to the plains . 6,4 Euro . __17_ Domaine de Peirecedes red 2000 "Regue des Botes" . Dense colour . Organic (Terra Vitis) chart . 13,5° . Almost only Mourvedre . 8,7 Euro .